We spend about a third of our lives asleep — a figure that may make all that time spent in bed seem like a waste. But according to neuroscientist Russell Foster, it is quite the opposite. 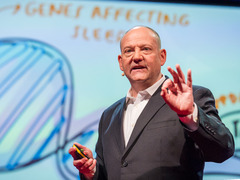 Russell Foster: Why do we sleep? In today’s talk, given at TEDGlobal 2013, Foster explores why we sleep, a question which no one has been able to definitively answer. We know that it is vital for our general health, that is likely connected to memory consolidation and that, without it, we are more prone to accidents. In the talk, he also gives a few tips for getting better sleep and debunks some common sleep-related myths. At the University of Oxford, Foster studies circadian rhythms — the internal 24-hour clocks that govern when we sleep, and that are partially regulated by exposure to light. According to his recent research, abnormal circadian rhythms are likely related to mental illness. Foster and his colleagues have found that patients with a range of afflictions — from schizophrenia to bipolar disorder — show severely disrupted sleep cycles. The work may have implications for diagnosing mental illness; certain sleep patterns may help pinpoint a disorder. The work could also eventually lead to new treatments for mental illness through tweaking sleep patterns with light therapy. Foster’s team has also found that sleep deprivation makes it more difficult to recall traumatic images, which could have therapeutic implications for people who suffer from post-traumatic stress disorder. His lab is also looking at promising new methods for shifting the body clock — and Foster thinks we may not be so far off from a pill to avoid jetlag, after all. The TED Blog checked in with Foster to talk about all this fascinating research. In the process, we also learned why Foster never takes a meeting before ten o’clock in the morning. How would you describe your area of research to a non-scientist? I’m interested in how our body clock and our sleep are both generated within the brain and how they’re regulated by light. My interests have spanned the fundamental neuroscience using animal models, mouse models, and then using this basic information to try and change clinical practice — to essentially use the fundamental science to improve the quality of life and wellbeing of humans. I’m very fortunate to work in an environment where basic scientists and clinical colleagues mix and share information in a really constructive, exciting framework. Why study sleep to begin with? What drew you to this area of research? I got into sleep because I studied 24-hour rhythms, or circadian rhythms. The 24-hour body clock has a profound influence on our sleep pattern, and the thing that I found so absolutely fascinating is that approximately 36% of our behavior is sleep behavior. So, in a single behavior, it is the most important thing that we do. But we think of sleep as an illness that needs a cure, or an unnecessary evil. Actually, it is a fundamental part of our biology. And so I became really interested in trying to understand this really big bit of what makes us what we are. In a five-year training as a medical student, you might get one or two lectures on sleep and it’ll be really very basic EEG; it won’t tell you very much about the neuroscience of sleep. And if you’re a practicing clinician, a [general practitioner], for example, it’s been estimated that around 30 to 40 percent of all the problems that you’ll see in terms of patients will either be directly or indirectly related to sleep problems. It is a really important fundamental biology and has huge clinical application, and yet it is being largely ignored both in terms of teaching and in terms of basic science. You mentioned that a lot of your work has to do with animal modeling. When I picture sleep research, I think of test subjects in a sleep lab connected to all kinds of wires, with scientists peering in through a one-way window. Do you ever do any research like that on human subjects in sleep labs? We’ve tended to move away from the sleep lab because what I’m interested in is using devices that are non-invasive and can measure sleep-wake patterns over long periods of time. I’m always concerned about bringing people from their home environments into the lab for two nights of sleep and then extrapolating from a very abnormal sleep situation back into the real world. So our approach in Oxford has been to measure sleep in the home environment. And that of course is what is so critically important in the study of people with mental illnesses. You have to get a sense of what’s going on with their sleep in their normal sleep environment. So whilst we do have sleep facilities and we do use them, really I want to move away from that. In fact part of our big institute here has evolved working with bioengineers, such as Gari Clifford, who are building these incredible new devices which can monitor rest activity cycles and a whole range of other bits of our physiology and behavior without us even noticing it for days and days and days. The plan is then to use mobile phone technology to beam this information to the lab so we don’t even have to go and download the equipment from the device. The mobile phone will send us the data at the end of each day. What kind of research do you still do in the sleep lab? There is some really interesting data that one of the PhD students, Kate Porcheret, has developed, which is the impact of keeping people awake. So, sleep deprivation. And what she has to do is sit with them and make sure that they don’t fall asleep all night, which means that she can’t fall asleep all night, so you know it’s quite difficult. But the reason she’s doing that is because she wants to look at the impact it has on our ability to remember traumatic events. The experiment is to show people a 20-minute video clip of depressing episodes of funerals, car accidents and all of those things, and then monitor the effect of sleep deprivation on their ability to remember these events. What’s so interesting is that she’s found that flashbacks—the remembrance of the events from these films—are much lower if people have been sleep deprived. And of course this has real implications for post-traumatic stress disorder; what one normally does with post-traumatic stress is put people to sleep, encourage them to sleep and what that will do is, it seems, consolidate the memories of these unpleasant events rather than help the brain forget them. Could that potentially lead to some sort of treatment for people with PTSD? Yes, it has some very important implications. [The data] are looking very, very interesting indeed. And as you point out, it will have serious, I think, clinical implications. What first gave you the idea look into links between sleep and mental illness? Was there a particular story or study or test subject that led you to that? I thought that was a very odd thing to say and that it didn’t make sense. Then I started looking into it and realized that people have been talking about people with really disrupted sleep with mental illness since the 1880s. So it’s a well-described phenomenon, but largely ignored. When people did start thinking about it in the 1970s, for example, they assumed that the abnormal sleep was a result of the antipsychotics that were being introduced at the time, but of course ignoring the fact that for the previous 100 years people had been talking about poor sleep without any antipsychotics. And then the other argument was that it is not the antipsychotics — it’s because of the socialized relations. This really intrigued me, so we used this tiny little wristwatch device to measure the rest activity cycle of patients diagnosed with schizophrenia. These patterns were absolutely smashed — these are the worst rest activity patterns I’ve seen, whether from a mouse or a human. This was really profound and I thought: “Hang on.” I worked really closely with my colleague, Katharina Wulff, and Katharina had the really good idea to compare unemployed individuals and look at their sleep-rest patterns as a parallel to work on those patients with schizophrenia. And actually, the unemployed don’t have particularly abnormal sleep patterns at all; their statistics are not very different from the working population, so clearly lack of a job was not causing this. Also, we had enough data to suggest that these abnormal sleep patterns were occurring irrespective of the antipsychotic medication. So this got us thinking — this is such a marked behavior that there is something else going on here. That observation, coupled with the fact that there was an increasing understanding of the biology of sleep, [made us realize] that doesn’t come from just one part of the brain, but from a network. Many parts of the brain are involved in generating sleep, and lots of different brain neurotransmitters. So then the penny dropped; it was basically that, well, hang on, if you have a defect in one of the neurotransmitters that predisposes you to mental illness, you’re going to have an effect upon sleep because sleep draws from all the brain neurotransmitters. It’s really complicated. Does the opposite ever happen? Does sleep deprivation also cause people without mental illness, or at least without a history of confirmed mental illness, to show symptoms of it? Well this is what’s interesting: we don’t really know. What has been reported is that the abnormal sleep pattern — so for example in depression and in prenatal depression — the abnormal sleep precedes the depressive episode. So whether the abnormal sleep is pushing you into that mental state we don’t know, but clearly, if you can consolidate sleep, you can remove some of the psychiatric symptoms. And as abnormal sleep precedes depressive illness, it would seem to me that abnormal sleep does precipitate some of these episodes, which of course has massive [clinical] implications. It’s worth pointing out we have relatively little understanding of how the current medications for mental illness work, how the antipsychotics work. Many of them are defective and so what sleep deprivation is is potentially an entirely new way to think about treating some of these appalling conditions. My next question has to do with your research leading to new therapies. What might that look like? What we’re finding is that the type of sleep disruption that you get is very variable and what we need to do is link the precise phenotype — the precise form of the sleep disruption — to these various mental conditions. It’s worth bearing in mind that the diagnosis of bi-polar and schizophrenia and all the rest of them deal in hugely broad blanket terms, and in fact there’s no clear definition of these conditions. The pattern of the abnormal pattern of sleep that you can record from these individuals might also help us with a more precise diagnostic about what [they’ve] actually got. Knowing the type of abnormal sleep pattern that you then have, you can then think about the ways in which you target it. If it’s a failure to regulate the clock to the external world, to the light-dark cycle for example, we’ve found many patients of schizophrenia who just drift through time. They get up later and later each day. Now, knowing that, we can then think about strengthening the light input to the clock and making sure they are absolutely locking into the daily day-night cycle. If it’s a fragmented and disrupted clock, then we can think about trying to consolidate it. So the pattern that we get, to some extent, will form the type of treatment that we would want to develop. So it seems like it would be very tailored for each person, depending on where they fall on the spectrum and their particular sleep problems? And one thinks: “Oh God, this is going to be terribly complicated.” But actually, because you can monitor people’s sleep and wake in their home environment essentially non-invasively, it’s actually fairly low cost because then you find out what the nature of the condition is instead of using a blanket drug approach. So in the end it’ll be a very cost-effective way of doing it. It’ll reduce time costs and hospitalization. With all your work on sleep, do you ever find yourself trying to analyze your own circadian pattern, or those of friends or family? I’m quite a late sleeper, so I have a body clock that is quite late. I typically go to bed late and get up quite late, and so I’m terrible because a lot of my clinicians have eight o’clock meetings, but I sort of say, “No, no. Meetings start at ten o’clock.” So yes, my body clock does actually bring me into conflict with some of my colleagues. But it’s very interesting because we all work on body clocks so everyone says, “Oh yeah, yeah.” They’re more accommodating because they know that you’ll get the best out of people when you match their circadian body clock time. And that’s part of the fun of it because now we’ve realized the importance of sleep on so many different levels. It’s not an indulgence, it’s not a luxury, and actually a good night’s sleep can have a huge impact on your ability to come up with novel solutions to complex problems. So if you want the best out of your team you let them get the sleep that they need. What we are working on at the moment are ways in which we can much more effectively shift the body clock. And we have a number of really exciting pathways we’re working on, which will have an impact on everything from jetlag to the abnormal clock you find in mental illness. Does that mean that maybe someday I’ll be able to take a pill when I travel around the world and not be able to suffer from jetlag so badly? Well, you know, I would have said up until recently that I think that’s unlikely. But the data in this study really raises the possibility of shifting the clock much more effectively. The data are just extraordinary. We’re years away from it yet but now, for the first time, we have a target that we didn’t have before. Has this research led to any implications for cause, treatment or cure of narcolepsy? I have a close friend whose adult daughter suffers from narcolepsy. She is very bright and a straight-A college student, but will likely have difficulty finding a job where she can be self-supporting because of her narcolepsy. Also, she has difficulty with some executive functioning and decision-making – when she is not careful of her “sleepy hygiene” this is markedly worse. It would be a very positive breakthrough for sufferers of narcolepsy if Dr Foster’s research is applicable. Thank you for an interesting article. I have Rem behavior sleep disorder and I have had 3 sleep studies 1 at home 2 at a sleep clinic. And I have to agree that the home setting is more realistic I’m lucky to exhibit 10% of what I normally do in my sleep when I am inside a clinic wired up all over me. It is a very frustrating, tiring condition to have. I have had it since I was a child and the only help I’ve been offered is heavy sleeping tablets and I am afraid to take them 1. Because of the dependence you will build up. 2. What is it doing to the rest of my body. I have had enough it is so severe my husband has to lock the door and hide the key so I can’t run outside and lock and bar the bedroom door so I can’t get out that way either. This study sounds very interesting I would love to be part of the research my case has been described as severe and very rare as I’m only 26. Good work guys. Great article. Fantastic article. I am excited to see what the research shows in the next few years. Since we also know that sleep is related to weight, we might be able to find out how it all fits together neurologically. This sums up why we should avoid psychiatrists, psychologists and therapists like the plague. Power trippers extraordinaire. Our Circadian rhythm is affected by many surroundings, and one lab test recently publicized in October 2013 may help us relieve one of those causes. My view into this has uncovered some opposition in the lighting industry for reasons of profit alone. Some claim that energy savings will outweigh Human health, so this resolution may need another decade or more. Shall our Government and politics be one highlight? Pingback: BodyResolution » Sleep: What’s the Perfect Amount? This research has been identified as very helpful to some of the greatest doctors at the Yale Neurological Epileptic Organization. My wife is the curator and she is very thankful for your information. Thank you and good luck. Interesting. I’ll watch the video. I get it…but I’m still sleep deprived!! Reblogueó esto en Vonferdinand Bussines Management..